Yarn: 2-ply handspun Corriedale from Porpoise Fur, in the colorway "Haematoma", spun up from the ends left over after dyeing. I had approximately 160 yds of more-or-less worsted weight yarn. Comments/modifications: such a lovely pattern! The hat comes in two different styles - beanie and beret - and while I wanted a slouchier hat, I didn't think I had enough yarn to make the beret. So I knit the beanie as written, but added in an extra half repeat of the stitch pattern to make it a little longer. This meant that I then had to shift the chart for the crown decreases, but once I wrapped my head around how that had to work, it was smooth sailing. I love the subtle striping from the handspun. This ended up coming out a lot redder then I would have predicted from the dyed fiber OR the yarn in the skein. Just another example of how much the look of handspun can change from fiber to yarn to FO. I'm thrilled with this lovely little hat, and am now wishing I had some more yarn to knit the matching mittens. However, I'm forging ahead to cast on one of my two Shawl Lots for the Porpoise Fur Two Color Shawl SAL/KAL, which I've been sitting on for ages. More handspun FOs ahead! Long time, no knitting content...we had three of my friends from grad school/rowing days down here for the weekend for a triathlon/catchup weekend, so opportunities for blogging were slim and none (and Slim left town a while back*). But I have been knitting. Devil has a friend at daycare whose parents are expecting their second baby any day now. Actually, her parents were friends first - the fact that C and Devil run around screeching like crazed banshees when we get together for dinner is just a bonus. I whipped up this super easy super cute baby hat in just a couple of days. Of course, being me, it took another week and a half to weave in the ends and wash the damn thing, but so be it. Yarn: Hot Socks Sockenwolle, color #214 - this is how it's listed in my stash spreadsheet, but I'm not sure it's correct. Comments/mods: no mods, I did the pattern as written (6 month size). 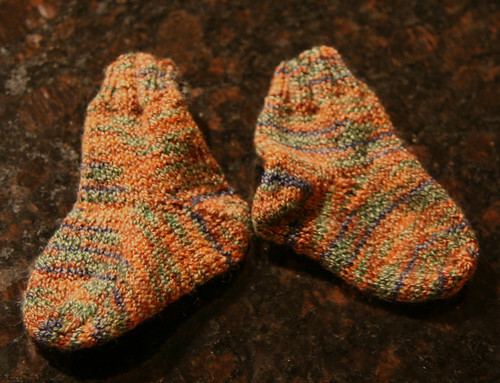 It was a very quick knit, and the basic pattern stitch is the same as the Jaywalker socks, so if you've made a pair of those, this should be a snap. I used 19 g (about 40 yds) for this hat - a great way to use up left overs from socks. This is going off to BBC (Baby Boy C) along with the pair of socks I made for Boo while we in the UK that were woefully inadequate for her footses. Hopefully they'll fit him for at least a couple of days before he grows out of them. These were just a standard, no-pattern stockinette sock with short row heel and what I think would be described as a wedge toe (decrease on 1 stitch on either side of the toe every other row for a bit, then every row before grafting remaining live stitches together). Perfect car knitting. and part of a back. Hopefully it will be done before the snow flies (not that there's going to be any snow flying around here in any but the most metaphorical sense) (unfortunately). * an Ironman phrase that gets a lot of use.